Nothing says summer like a cold, fruit filled glass of sangria. Mmmmmm There are a thousand recipes out there that add everything from kiwi (blech) to apples, white wine to red, but this one is by far my favorite. Simple, sweet, and so, so good. Mix together lemon juice, lemonade concentrate, orange juice, red wine, and triple sec. Float slices of lemon, orange, and lime in the mixture. Add ginger ale shortly before serving. 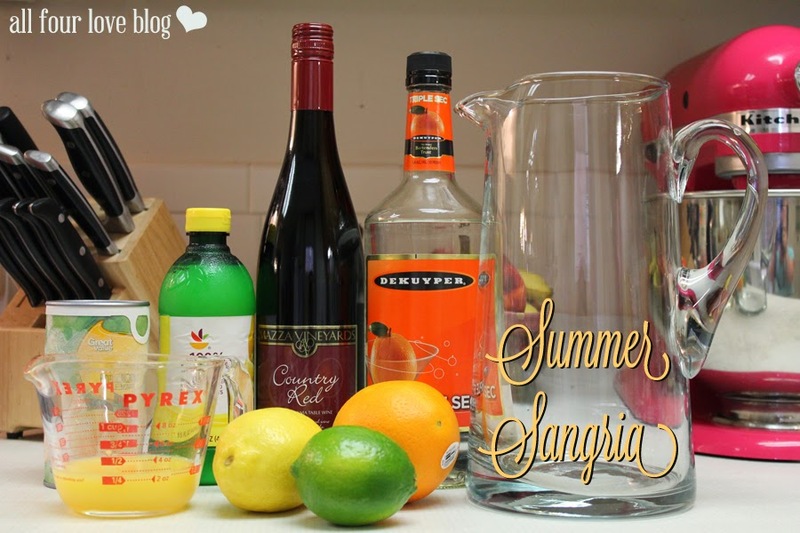 I bought this big glass pitcher just for this sangria recipe and I'm not afraid to admit it! It's just too pretty to be poured out of a plastic tub; it's not Kool Aid, people! As a fun side note, this can also be frozen and made into a slushy! Just let it sit in the fridge over night as directed, then remove the fruit pieces and strain to get all the little pieces out. Then, put into a zip lock bag in the freezer for about 2 hours. The alcohol in it should keep it from freezing solid. Mash it up in the bag and spoon into pretty glasses or bowls. I'm making this, along with grilled peaches and ice cream, for a My 31 party I'm hosting tonight. A kid free night with sweets and wine? Sounds fabulous to me. Cheers!